In the present paper, we select a neotype for Tremella cerasi and prove that it is conspecific with Ditangium insigne (the genus type of Ditangium). We argue that Ditangium should be restored as a correct genus for T. cerasi, while the currently used generic name Craterocolla is to be treated as its younger synonym. Morphological, ecological and genetic variability of Ditangium cerasi is discussed, and two other Ditangium species are described—D. altaicum, sp. nov. and D. incarnatum, comb. nov. In addition, Exidia fulva is combined in Globulisebacina. Craterocolla cerasi (Schumach.) Bref. is a jelly fungus well known to mycologists due to a peculiar crater–like anamorphic stage (Hansen and Knudsen 1997; Oberwinkler et al. 2014). According to recent DNA–based studies, Craterocolla has been placed to the Sebacinales (Agaricomycetes, Basidiomycota) (Weiss et al. 2004; Oberwinkler et al. 2014). In these studies, the genus was considered monotypic i.e., limited to the type species, Tremella cerasi Schumach., but no attempts to clarify its identity, as well as the genus concept, were performed. No type material for T. cerasi has been located and its protologue (Schumacher 1803) is obscure and thus opened to controversial interpretations (Donk 1966). In particular, Fries (1822) did not accept this species and simply treated it among synonyms of Tremella sarcoides (Jacq.) Fr. (now Ascocoryne sarcoides (Jacq.) J.W. Groves & D.E. Wilson, Ascomycota). The current understanding of T. cerasi originates from Tulasne and Tulasne (1873). 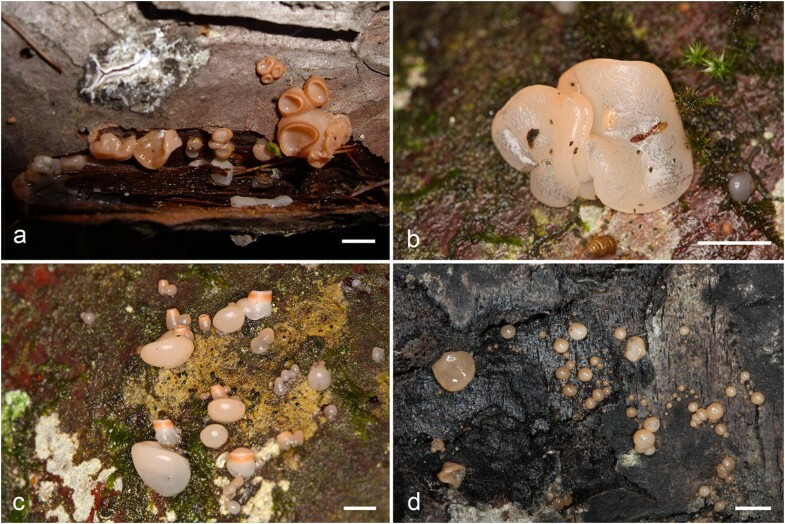 The latter authors associated Schumacher’s species name with a jelly fungus inhabiting cherry trees in France and having longitudinally septate, four-celled basidia and cylindrical, curved basidiospores, as well as a characteristic anamorph. When Brefeld (1888) introduced the genus Craterocolla, he relied on the Tulasne’s understanding of T. cerasi, and this interpretation has been accepted by most subsequent authors (Saccardo 1888; Neuhoff 1935, 1936; Pilát 1957 etc.). Two earlier generic names, Ditangium P. Karst. (Karsten 1867) and Poroidea Göttinger (in Sauter 1880), were treated as heterotypic synonyms of Craterocolla (Donk 1966; Wojewoda 1981) but disregarded in favour of the latter. In the present study, we designate a neotype for Tremella cerasi and revise available specimens of Craterocolla cerasi from boreal–temperate Northern Hemisphere. The identity of Ditangium insigne P. Karst. and Exidia testacea Raitv. is clarified based on morphology and DNA studies of types. In addition, a new combination in Globulisebacina is proposed. 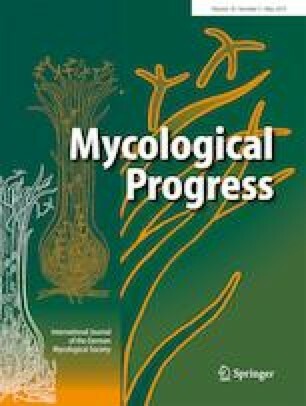 This paper is our homage to Prof. Franz Oberwinkler, one of the most distinguished researchers of jelly fungi, in particular the Sebacinales. Type specimens and other collections from herbaria H, LE, O, UPS, TRH, S, TAAM, CWU, as well as from the Mycological Herbarium of the Department of Biology, University of West Bohemia, Czech Republic (informally abbreaviated KBI), were studied. Herbarium acronyms are given according to Thiers (2016). Microscopic routine follows Miettinen et al. (2018). All observations and measurements were made from microscopic slides prepared in Cotton Blue, using phase contrast and oil immersion lens (Leitz Diaplan microscope, × 1250 amplification). At least 20–30 basidiospores and 10–20 conidia were measured for each studied specimen. The following abbreviations are used in microscopic descriptions: L–mean cell length, W–mean cell width, Q′–length/width ratio, Q–mean length/width ratio, n–number of measurements per specimens measured. For DNA extraction, small fragments of dried basidiocarps were used. In total, 14 specimens were selected for molecular sampling (Table 1). DNA was extracted using the NucleoSpin Plant II Kit (Macherey-Nagel GmbH & Co. KG) according to the manufacturer’s instructions. The following primers were used for both amplification and sequencing: ITS1F-ITS4 (White et al. 1990; Gardes and Bruns 1993) for ITS region; primers EF1-983F and EF1-1567R for approximately 500 bp of tef1 (Rehner and Buckley 2005). PCR products were purified applying the GeneJET Gel Extraction Kit (Thermo Scientific, Thermo Fisher Scientific Inc., MA, USA). Sequencing was performed with an ABI model 3130 Genetic Analyzer (Applied Biosystems, CA, USA). Raw data were edited and assembled in MEGA 6 (Tamura et al. 2013). For this study, 19 ITS and 15 tef1 sequences were generated. Additionally, four sequences (three nrITS and one tef1) including the outgroups were retrieved from GenBank (www.ncbi.nlm.nih.gov/genbank/). 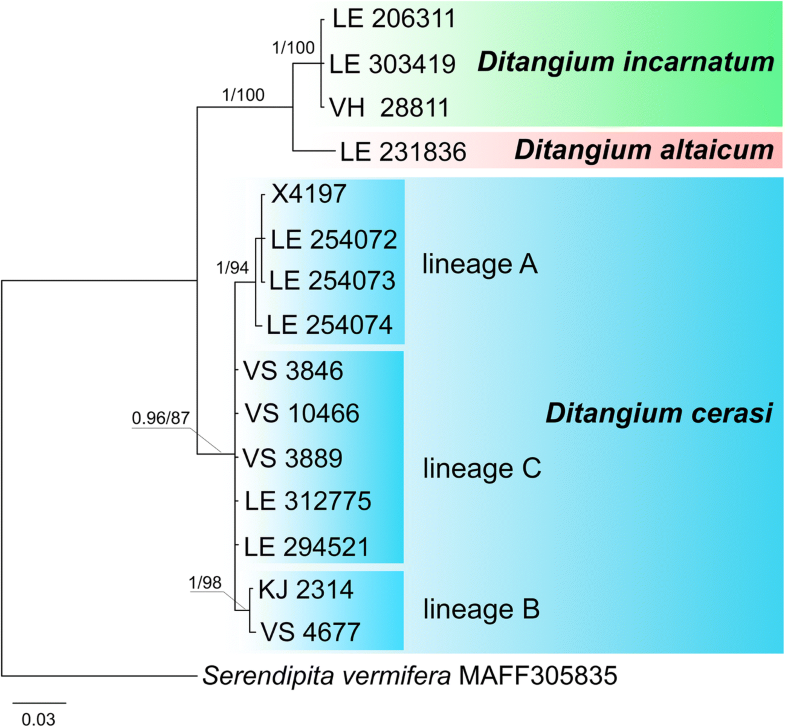 GenBank matches as well as preliminary multiple alignments prepared by us showed that tef1 sequences of Ditanigum spp. obtained for this study contain two introns. These introns were phylogenetically informative, and therefore they were not removed from the phylogenetic analyses. Sequences were aligned with the MAFFT version 7 web tool (http://mafft.cbrc.jp/alignment/server/) using the Q-INS-i option for nrITS. Phylogenetic reconstructions for three data sets (nrITS, tef1, nrITS+tef1) were performed with maximum likelihood (ML) and Bayesian (BA) analyses. Before the analyses, the best-fit substitution models for the alignment were estimated for each dataset based on Akaike Information Criterion (AIC) using FindModel web server (http://www.hiv.lanl.gov/content/sequence/findmodel/findmodel.html). Selected models were as follows: ‘GTR plus Gamma’ for nrITS dataset; ‘GTR’ for nrITS+tef1 dataset; ‘TrN: Tamura-Nei plus Gamma’ for tef1 dataset. ML analyses were run in the PhyML server, v. 3.0 (http://www.atgc-montpellier.fr/phyml/), with 1000 rapid bootstrap replicates. BA was performed with MrBayes 3.2.5 software (Ronquist et al. 2012), under selected model for each data set, for two independent runs, each with 5 million generations with sampling every 100 generations and four chains. Tracer v. 1.6.0 (Rambaut et al. 2014) was used to evaluate the quality of a sample from the posterior and the continuous parameters, using effective sample size (ESS). We accepted the result where the ESS (effective sample size) was above 200 and the PSRF (potential scale reduction factor) was close to 1. The clades with posterior probability (PP) value > 0.95 were considered to be significantly supported. Newly generated sequences have been submitted to GenBank (Table 1) and alignments to TreeBase (S23714, S23715, S23721). Ditangium altaicum. Russia. Altai Republic: Ulagan Dist., Altai Nat. Res., Alnus sp., 18.VIII.2008 Malysheva (LE 231836*, holotype). D. cerasi. Czech Republic. Central Bohemia: Roztoky, Řivnáč hill, Prunus cerasus, 2.I.2010 Kout* (KBI, H 7008918). South Bohemia: Tábor, Chýnov, P. cerasus, 30.IX.2002 Kout (H 7008919*–neotype of Tremella cerasi, KBI–isoneotype). Finland. Etelä-Häme: Tammela, Mustiala, Picea abies, 10.X.1866 Karsten 3508* (H, lectotype of Ditangium insigne). Perä-Pohjanmaa: Tervola, Hirvikumpu, Betula sp., 20.X.2005 Hyvärinen* (H). Kittilän Lappi: Kolari, Kesänkijärvi, P. abies, 6.V.2016 Junninen 2314* (H). France. Aveyron: St. Sernin, P. cerasus, III.1905 Galzin 810 (herb. Bourdot 4566) (UPS). Germany. Bayern: Garmisch-Partenkirchen, Oberammergau, P. abies, VIII.1894 Schnabl (as Poroidea pithyophila, H ex Fungi Bavarici #936). Norway. Vest-Agder: Mandal, Uføra, Quercus robur, 2.XI.2017 Spirin 11773 (O). Oppland: Sel, Sagåa Nat. Res., Alnus incana, 13.IX.2016 Spirin 11073* (O). Nor-Trøndelag: Steinkjer, Byahalla Nat. Res., A. incana, 11.V.2014 Holien 22/14 (TRH F15861). Russia. Karachaevo-Cherkessia: Karachaevsk Dist, Teberda Nat. Res., Picea orientalis, 8.VIII.2009 Malysheva (LE 254072*, LE 254074*), Abies nordmanniana, 12.VIII.2009 Malysheva (LE 254073*). Komi Rep.: Troitsko-Pechersky Dist., Pechoro-Ilych Nat. Res., P. abies, 13–15.IX.1992 Hermansson & Lundqvist (UPS F-013743, F-013748), Pinus sylvestris, 19.IX.1992 Hermansson & Lundqvist (UPS F-141037). Krasnoyarsk Reg. : Ermakovskoe Dist., Sayano-Shushensky Nat. Res., Pinus sibirica, 27.VIII.2015 Malysheva (LE 312775*); Mansky Dist., Badzhei, Abies sibirica, 6.IX.1958 Parmasto (TAAM 9173*, holotype of Exidia testacea). Khabarovsk Reg. : Solnechny Dist., Igdomi, Picea ajanensis, 6.VIII.2011 Spirin 3846* (H), Pinus pumila, 6.VIII.2011 Spirin 3889* (H). Leningrad Reg. : Boksitogorsk Dist., Kolp’, P. abies, 26.IX.2011 Spirin 4677* (H), Vozhani, Betula pubescens, 30.VII.2016 Spirin 10466* (H). Primorie. Ternei Dist. : Sikhote-Alin Nat. Res., Pinus koraiensis, 24.VIII.2012 Malysheva (LE 294521*). Slovakia. Banská Bystrica: Banská Štiavnica, Prenčov, Malus sp., 3.XI.1896 Kmet (UPS). Ukraine. Ivano-Frankivsk Reg. : Nadrivna Dist., Carpathian Nat. Park, P. abies, VI.2011 Akulov (CWU 7018). D. incarnatum. Finland. Etelä-Häme: Iitti, Säyhtee, Populus tremula, 25.IV.2012 Haikonen 28811* (H); Tammela, Mustiala, Salix pentandra, 1.IX.1886 Karsten 1324 (H 6049583, lectotype of Dacrymyces incarnatus). Norway. Akershus: Nannestad, Sundby, P. tremula, 17.IX.1964 Eckblad (O F160849). Russia. Leningrad Reg. : Priozersk Dist., Otradnoe, P. tremula, 7.X.1995 Zmitrovich (LE 206311*). Primorie. Ternei Dist. : Sikhote-Alin Nat. Res., P. tremula, 20.VIII.2012 Malysheva (LE 303419*). Globulisebacina fulva. Portugal. Castelo Branco: São Fiel, Eucalyptus globulus, XII.1903 Torrend 438 (S F20578, lectotype of Exidia fulva). While discussing generic names of the European heterobasidiomycetes, Donk (1966) preferred Craterocolla as the correct genus for T. cerasi and rejected two older genera, Ditangium and Poroidea, since they were based on anamorphic stages. His solution followed Art. 59 of the Montreal Code (1961) and was accepted by the subsequent authors. However, Art. F.8.1 of the current Code (2018) prescribes to choose the oldest legitimate name, whether teleomorphic or anamorphic, for naming a genus. Therefore, Ditangium should be used instead of Craterocolla if we assume that their type species, D. insigne P. Karst. and T. cerasi, are congeneric. The protologue of T. cerasi (Schumacher 1803: 438) gives no clear answer what was the species it had been intended for. It referred to a jelly fungus with cerebriform, substipitate, reddish fructifications (‘gyroso-lobata substipitata dilute purpurascens diaphana’) occurring on bark and wood of cherry trees in Denmark. Donk (1966) argued that it most probably implies the imperfect stage of an ascomycete; he was apt to associate it with Sirobasidium cerasi Bourdot & Galzin. If his opinion is accepted, then T. cerasi becomes an older name for S. cerasi and Craterocolla replaces Endostilbum Malençon (Ascomycota) at the generic level. We find these taxonomic changes disadvantageous and prefer to follow the prevailing understanding of T. cerasi as a heterobasidiomycete with a characteristic anamorphic stage (see also Recommendation 9A4 of the Code). To confirm this tradition, a neotype for T. cerasi is designated below. Neuhoff (1935) considered T. cerasi (as Ditangium cerasi (Schumach.) Costantin & L.M. Dufour) and D. insigne (the generic type of Ditangium) as taxonomic synonyms. On the other hand, Laurila (1939) and Eriksson (1958) continued to label North European collections as D. insigne. They argued that different distribution areas (temperate versus boreal Europe) and host preferences (Prunus cerasus versus Picea) supported the interpretation that two independent ‘biological species’ were present. In order to investigate this hypothesis, the authentic specimen of D. insigne (selected as a lectotype below), the holotype of Exidia testacea Raitv. (synonymized with C. cerasi by Malysheva 2012) and 19 specimens of D. cerasi s.l. collected from various host over temperate–boreal Eurasia have been studied by morphological and DNA methods. a small clade (pp = 0.99, bs = 86) containing sequences of two specimens found on Populus tremula (LE 206311 from North-West Russia and LE 303419 from Russian Far East) plus one collection from Alnus (LE 231836, Altai). Four bp difference exists between aspen- and alder-dwelling specimens. The variability of the ITS region in both clades prompted us to produce a tef1 dataset. tef1 phylogeny. The final alignment contained 612 characters (including gaps). All clades detected in tef1 phylogeny are strongly supported and the overall picture is more nuanced (Fig. 2). 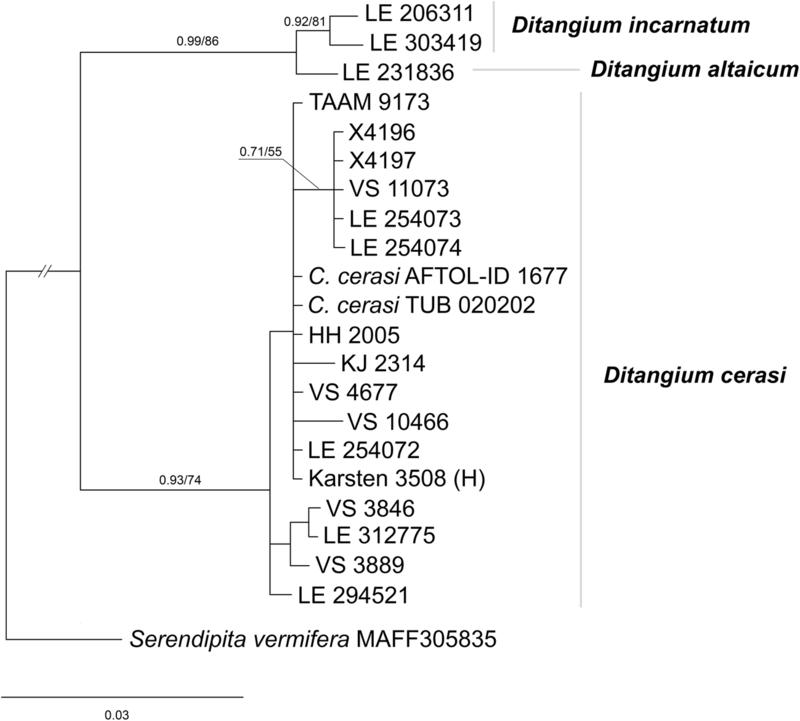 the Alnus-dwelling specimen LE 231836 showing considerable difference (4%) in tef1 region versus D. incarnatum represents a new species, D. altaicum. Combined nrITS + tef1 phylogeny. The final alignment contained 1219 characters (including gaps). The two-gene combination was not effective enough to clarify the relationships within the group further. 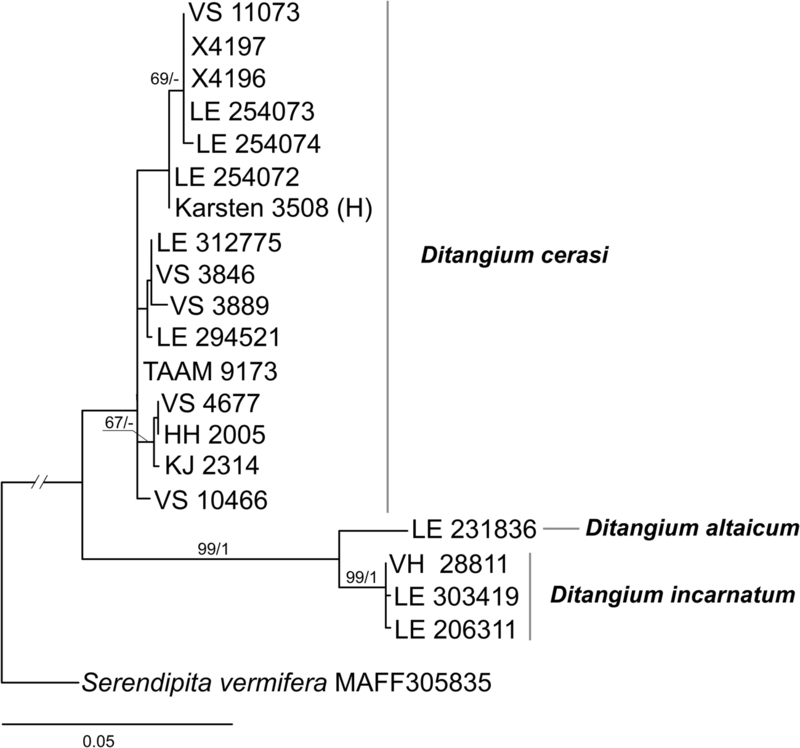 However, nrITS + tef1 phylogeny clearly uncovers three lineages corresponding to the three morphological species—D. altaicum, D. incarnatum and D. cerasi (Fig. 3). The combined phylogeny does not support further splitting of the latter lineage, as opposed to morphological data and, partly, geographic distribution and host preferences. This problem should be addressed by using still other genetic markers. For the moment, we accept Neuhoff’s opinion and treat T. cerasi and D. insigne as taxonomic synonyms. Ditangium P. Karst., Notiser Sällsk. Fauna Flora Fennica Förhandl. 11: 213, 1870. Basidiocarps pustulate or cerebriform, small- to medium-sized, pink to brick-red. Conidial fructifications occasionally present, appearing on or together with teleomorphic basidiocarps, crater-like. Monomitic; hyphae clampless, abundantly encrusted by oily matter. Hyphidia abundant, covering hymenial surface, sparsely or richly branched. Basidia (2) 4-celled, obovate to subglobose, longitudinally or obliquely septate. Basidiospores hyaline, thin-walled, narrowly fusiform to cylindrical. Hyphae of anamorphic fructifications similar to those of the teleomorph; conidia thin-walled, cylindrical, slightly to strongly curved. On wood of deciduous trees and conifers at an early stage of decompostition. Genus type. Ditangium insigne P. Karst. The genus is re-introduced here to encompass three closely related species (see below). No material from North and South America has been available for this study. The identity of two species currently associated with Ditangium i.e., Dacrymyces conglobatus Peck from the north-eastern part of the USA and Ditangium minutum Pat. from Ecuador, should be re-checked based on newly collected material from those areas. Ditangium altaicum V. Malysheva & Spirin, sp. nov. (Fig. 4a). Holotype. Russia. Altai Republic: Ulagan Dist., Altai Nat. Res., Alnus sp., 18.VIII.2008 Malysheva (LE 231836). Basidiocarps cerebriform, 3–7 mm in diam. and 1.5–3 mm thick, pink to brick-red. Conidial fructifications absent. Hyphae clampless, interwoven or ascending, abundantly encrusted by oily matter; tramal hyphae thin-walled, 1.5–2.5 μm in diam., subhymenial hyphae thin-walled, 1–2.5 μm in diam. Hyphidia abundant, covering hymenial surface, richly branched, apical branches 1–1.2 μm in diam. Basidia (2) 4-celled, obovate to subglobose, (8.0–) 8.1–9.9 (− 11.0) × (6.7–) 6.8–7.8 (− 8.0) μm (n = 20/1), sterigmata up to 22 × 1–1.5 μm. Basidiospores narrowly fusiform, straight or slightly concave, (7.8–) 8.0–10.3 (− 11.8) × (2.8–) 2.9–3.3 (− 3.6) μm (n = 30/1), L = 9.11, W = 3.11, Q′ = (2.3–) 2.6–3.4 (− 3.6), Q = 2.93. Remarks: Ditangium altaicum possesses small-sized basidiocarps and no conidial stage and thus it is more or less macroscopically identical to D. incarnatum. These species can be separated mainly due to differently looking basidiospores–fusiform and almost always straight in D. altaicum and cylindrical and often clearly curved in D. incarnatum. Ditangium altaicum is so far known only from the locus classicus in Siberia. Ditangium cerasi (Schumach.) Costantin & L.M. Dufour, Nouvelle flore des champignons: 207, 1891. (Figs. 4b, 5 and 6a–c). ≡ Tremella cerasi Schumach., Enumeratio Plantarum, in Partibus Saellandiae Septentrionalis et Orientalis Crescentium 2: 438, 1803. Neotype (selected here). Czech Republic. South Bohemia: Tábor, Chýnov, Prunus cerasus, 30.IX.2002 Kout (H 7008919, isoneotype–KBI) (MBT 383584). ≡ Craterocolla cerasi (Schumach.) Bref., Unters. Gesamtgeb. Mykol. 7: 99, 1888. ≡ Exidia cerasi (Schumach.) Ricken, Vadem. Pilzfr. : 274, 1918. = Ditangium insigne P. Karst., Fungi Fenniae Exsiccati 7: 656, 1867. Lectotype (selected here). Finland. Etelä-Häme: Tammela, Mustiala, Picea abies, 10.X.1866 Karsten 3508 (H) (MBT 383585). = Poroidea pithyophila Göttinger in Sauter (as pityophila), Mitt.Gesellsch. Salzburger Land. 20: 218, 1880 (fide Donk 1966). = Exidia testacea Raitv., Plants and Animals of the Far East: 117, 1971. Holotype. Russia. Krasnoyarsk Reg. : Mansky Dist., Badzhei, Abies sibirica, 6.IX.1958 Parmasto (TAAM 9173). Basidiocarps cerebriform, 5–20 mm in diam., 3–8 mm thick, pink to brick-red, senescent basidiocarps sometimes fading to almost white. Conidial fructifications occasionally present, appearing on or together with teleomorphic basidiocarps, crater-like, 1–2 mm in diam. Hyphae clampless, interwoven or ascending, abundantly encrusted by oily matter; tramal hyphae thin- to slightly thick-walled, (1.5–) 2–4 μm in diam., occasionally inflated up to 5 μm in diam., subhymenial hyphae thin-walled, (1–) 1.5–3 μm in diam. Hyphidia abundant, covering hymenial surface, sparsely or richly branched, apical branches 1–2 μm in diam. Basidia (2) 4-celled, obovate to subglobose, (7.8–) 8.1–11.2 (− 12.8) × (6.1–) 6.6–9.6 (− 10.0) μm (n = 65/8), sterigmata up to 30 × 1–2 μm. Basidiospores narrowly cylindrical to cylindrical, slightly to distinctly curved, (7.1–) 7.2–12.9 (− 15.2) × (2.6–) 2.7–4.4 (− 4.5) μm (n = 320/13), L = 8.32–10.72, W = 2.98–3.95, Q′ = (2.0–) 2.1–3.9 (− 4.1), Q = 2.44–3.34. Hyphae of anamorphic fructifications similar to those of a teleomorph but often with thickened walls (except thin-walled conidiiferous branches); conidia thin-walled, cylindrical, predominantly slightly to moderately curved (lunate), (4.8–) 4.9–8.2 (− 9.2) × (1.7–) 1.8–2.3 (− 2.6) μm (n = 60/3), L = 5.63–6.91, W = 1.97–2.20, Q = 2.87–3.27 (lineage A–Fig. 5.3) or (5.2–) 5.8–8.8 (− 9.4) × (1.6–) 1.8–2.5 (− 2.8) μm (n = 49/3), L = 7.06–7.67, W = 1.98–2.27, Q = 3.38–3.58 (lineage B–Fig. 5.4), or moderately to strongly curved, (5.7–) 5.8–8.9 (− 9.1) × (2.1–) 2.2–3.0 (− 3.1) μm (n = 20/1), L = 6.88, W = 2.62, Q = 2.66 (lineage C–Fig. 5.5). Remarks: As understood here, D. cerasi is a widespread species in Eurasia although it is rarely collected. It occurs on various hosts—both conifers (Abies, Picea, Pinus) and deciduous trees (Alnus, Betula, Malus, Prunus, Quercus). Ditangium incarnatum (P. Karst.) Spirin & V. Malysheva, comb. nov. (Figs. 4c and 6d). 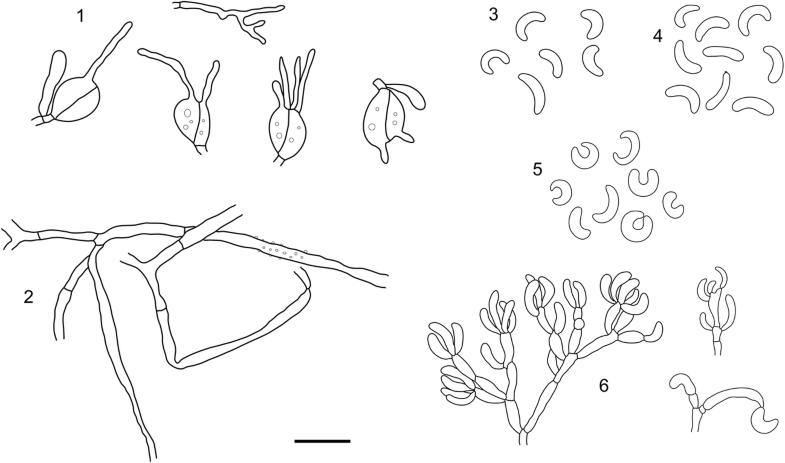 ≡ Dacrymyces incarnatus P. Karst., Medd. Soc. Fauna Fl. Fennica 14: 83, 1887. Lectotype (selected here). Finland. Etelä-Häme: Tammela, Mustiala, Salix pentandra, 1.IX.1886 Karsten 1324 (H 6049583) (MBT 383580). Basidiocarps normally pustulate, 1–1.5 mm in widest dimension, rarely fusing together and then cerebriform, up to 5–6 mm in diam. and 3–4 mm thick, pink to yellowish-cream. Conidial fructifications absent. Hyphae clampless, interwoven or ascending, abundantly encrusted by oily matter; tramal hyphae thin- to slightly thick-walled, (2–) 2.5–3.5 μm in diam., subhymenial hyphae thin-walled, 1–2.5 μm in diam. Hyphidia abundant, covering hymenial surface, richly branched, apical branches 0.8–1.2 μm in diam. Basidia (2) 4-celled, obovate to subglobose, (7.1–) 7.2–10.6 (− 11.0) × (6.1–) 6.2–8.0 (− 8.1) μm (n = 30/3), sterigmata up to 34 × 1–1.5 μm. 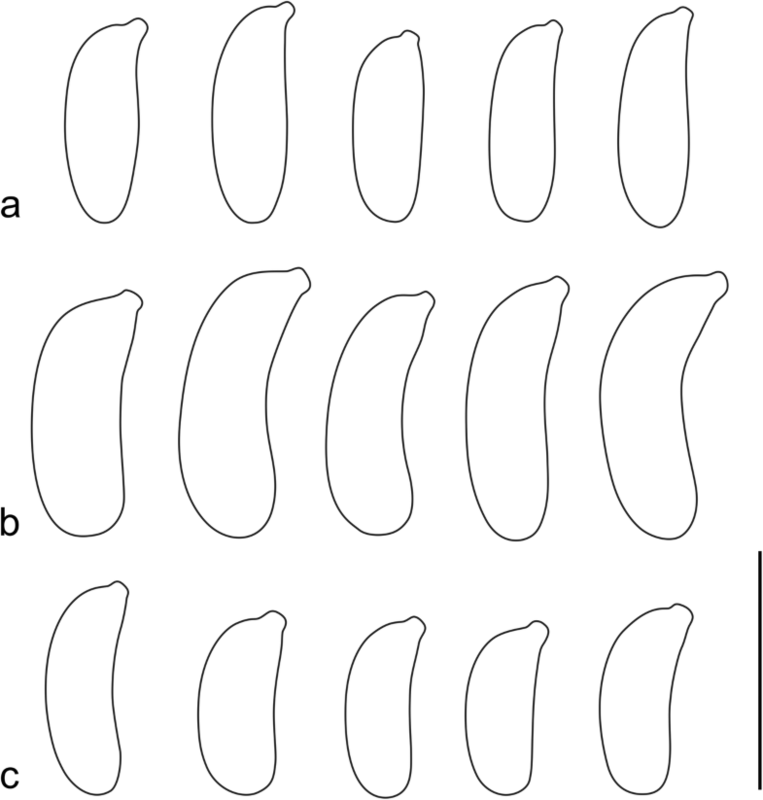 Basidiospores narrowly cylindrical, slightly to distinctly curved, (6.0–) 6.3–10.2 (− 10.3) × (2.6–) 2.7–3.6 (− 3.7) μm (n = 80/4), L = 7.10–8.72, W = 2.94–3.09, Q′ = (2.1–) 2.2–3.3 (− 3.5), Q = 2.42–2.87. Remarks: This species was described by Karsten (1887) based on a single collection from Finland but it has remained unknown or unrecognised (cf. McNabb 1973). Morphological study revealed that Karsten’s type is identical to four other specimens collected on wood of Salicaceae in temperate–hemiboreal Eurasia. Ditangium incarnatum differs from D. cerasi in having essentially smaller basidiocarps and on average shorter basidiospores. No conidial stage associated with D. incarnatum has been detected. The closely related D. altaicum has differently shaped (fusiform) basidiospores. Globulisebacina fulva (Bres. & Torrend) Spirin, comb. nov.
≡ Exidia fulva Bres. & Torrend, Brotéria, Sér. Bot. 11: 89, 1913. Lectotype (selected here). Portugal. Castelo Branco: São Fiel, Eucalyptus globulus, XII.1903 Torrend 438 (S F20578) (MBT 383582). Basidiocarps pustulate or cupulate, gregarious, gelatinous, yellowish to brownish, 1–1.5 mm in diam., 0.1–0.3 mm thick, partly fusing but remaining discernable. Hyphal structure monomitic. Hyphae ascending, hyaline to brownish, richly branched, some twisted, simple-septate, (2.0–) 2.2–3.3 (− 3.7) μm in diam. (n = 20/1), CB (+), some hyphae bearing amorphous brownish incrustation (seen in Cotton Blue). Cystidia absent; hyphidia abundant, covering hymenial surface, hyaline to brownish, richly branched, 1.5–2.5 μm in diam. at the apical part. Basidia broadly ellipsoid to ovoid, hyaline to pale brownish, 2–4-celled, with longitudinally or obliquely oriented inner septa, 11.5–16 × 9–11.5 μm (n = 12/1), without a basal clamp, some senecent basidia slightly thick-walled; sterigmata subulate, up to 15 × 2.5–4 μm. Basidiospores cylindrical, more or less clearly curved, hyaline, thin-walled, (11.3–) 12.0–15.8 (− 18.2) × (4.5–) 4.8–7.7 (− 7.8) μm (n = 20/1), L = 14.07, W = 6.20, Q′ = (1.8–) 2.0–2.6 (− 2.8), Q = 2.30. Remarks: Searching for older names potentially connected to Ditangium spp. led us to Exidia fulva, a completely forgotten species described from Portugal. Yellowish or brownish basidiocarps and encrusted, clampless hyphae of the lectotype are reminiscent of Ditangium although basidia and basidiospores of E. fulva are essentially larger. In our opinion, E. fulva is very similar to or probably identical with Exidia rolleyi L.S. Olive as the latter has been introduced by Olive (1958), Wells (1975) and Roberts (2011). The latter species was placed in Efibulobasidium K. Wells (Wells 1975) and recently moved to its own genus, Globulisebacina Oberw. et al. (2014) (Sebacinales, Basidiomycota). Therefore, a new combination in Globulisebacina is proposed. The curators of herbaria TAAM, UPS, CWU, S, TRH are thanked for providing specimens for loan. Open access funding provided by University of Helsinki including Helsinki University Central Hospital. The research was supported by Norwegian Biodiversity Information Centre (the project ‘A survey of Norwegian jelly fungi’, grant number knr. 44-15) (the authors KHL and VS), by Komarov Botanical Institute, Russian Academy of Sciences (project АААА-А19-119020890079-6) (the author VM), by the Estonian Science Agency (project IUT20-30) and the European Union through the European Regional Development Fund (Centre of Excellence FIBIR) (the author AS).